The renovations and decorating are now well under way, and Paul is doing a marvellous job of being chief decorator, cook, cleaner and bottle washer. I’m still out of action and most likely will be for at least another four weeks, although I’m now managing now to do a few more things for myself – like fastening my own bra, and tying my own shoe laces. Im still having weekly visits for X-rays to check its all healing well, and to change the plaster which gets lose as the swelling reduces. Pauls painted the entrance and will finish painting the two spare rooms today. We’ll pick up some finishing items for them tomorrow, a mirror for the entrance and curtains for the windows. Then its just waiting for the new carpet to arrive. They look really good. We try and fit a walk in most days which is usually either along the river, or up town to collect groceries. 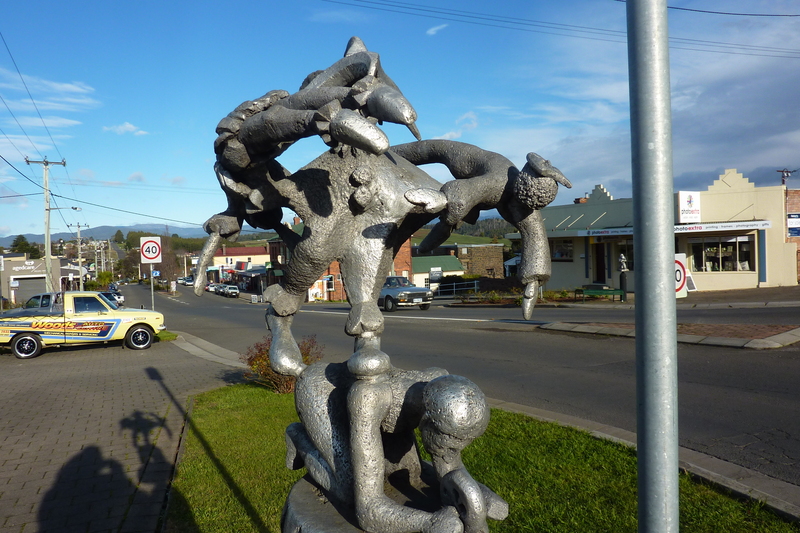 Whilst the idea of returning to the life of a ‘Grey Nomad’ is still very exciting and strongly beckons, having to spend some time here in Deloraine is by no means a hardship. The town is a lovely place to walk around, and to date I’ve yet to see a nicer, prettier or more interesting town. 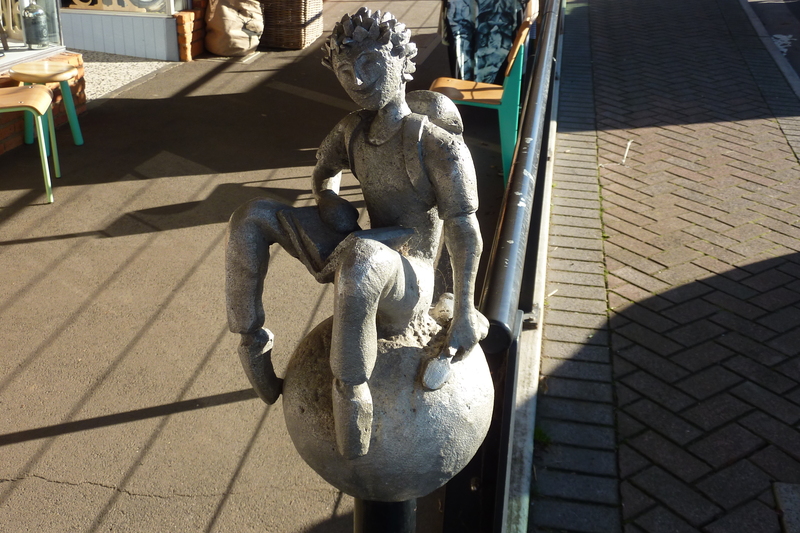 The street has lovely metal sculptures every couple of lamp posts apart. There must be at least three dozen in total and include guitar playing minstrels, circus troops, Tai-Chi, wood cutters etc. 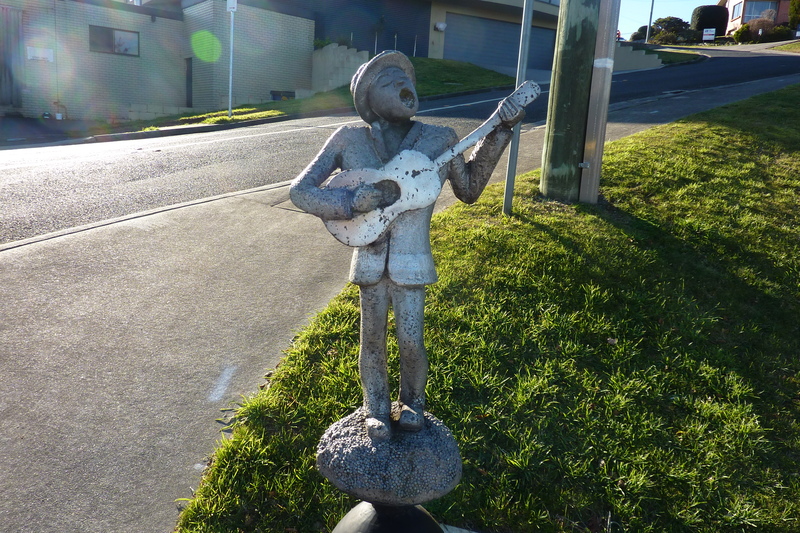 You name it, its probably represented in the sculptures on Deloraine’s main street. Then theres the multitude of arts and craft shops, and I’m not talking old ladies crotchet and hand knits, although they’re here also. 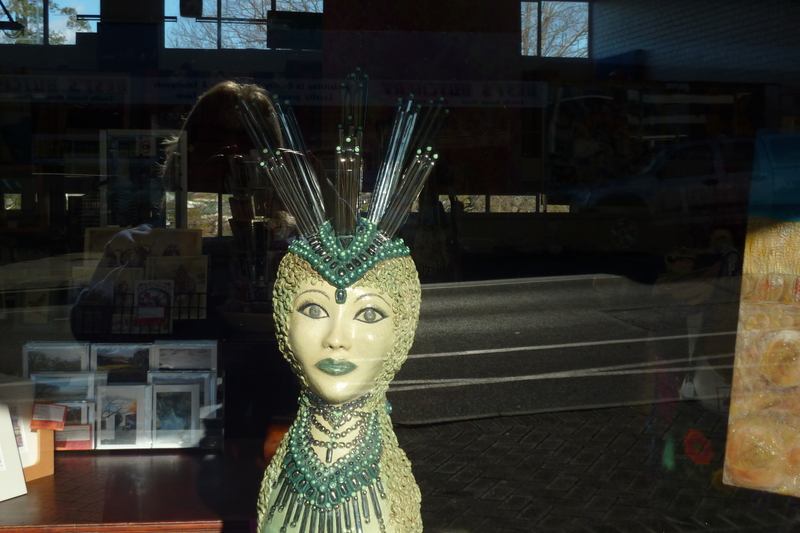 Walking up and down the street there’s so many window displays that successfully beckon one inside for a closer look. One of my favourites is the Alpaca shop which has some lovely items, some crafted here in Deloraine, and some from as far away as Peru. Be warned though, you need more than small change to make a purchase there, a lot more…. 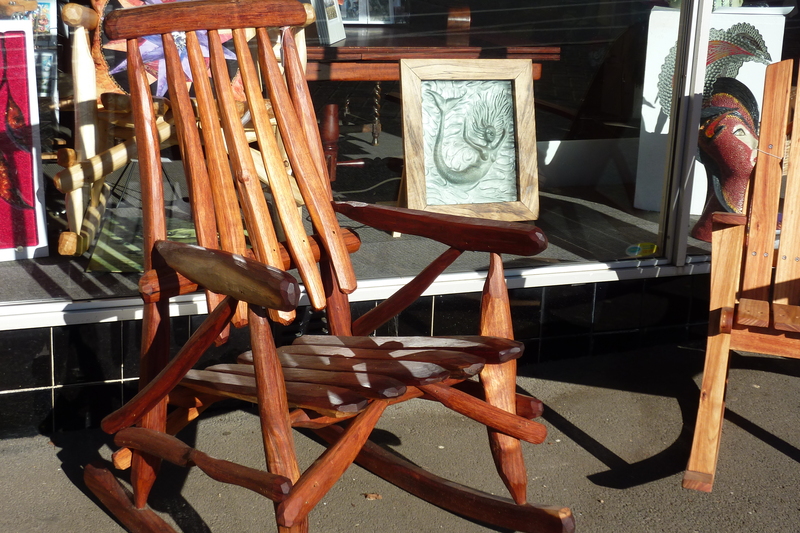 Theres lovely rustic hand made wood craft, like these rocking chairs adorning the footpath outside a craft shop. 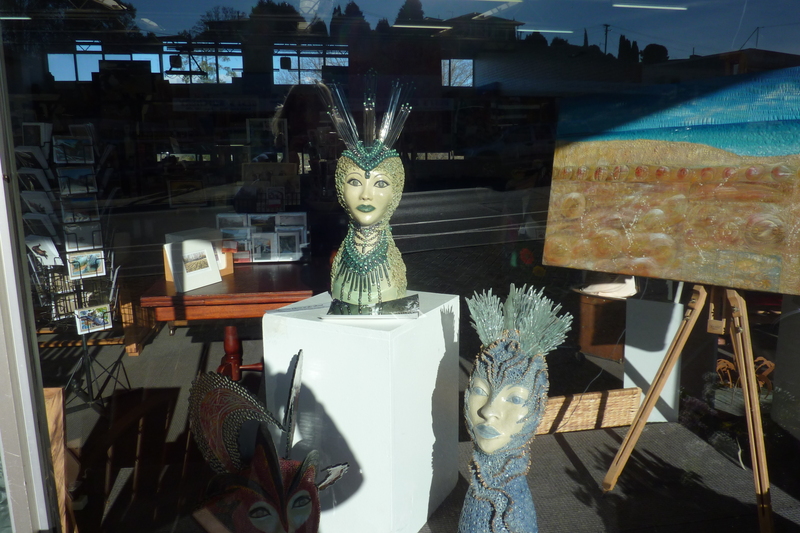 My favourite window display at the moment though is these three heads. I love the green one which I think is titled something like ‘Entrancestress of the Forest’. The blue one has a similar name but for the ocean, and the red one is for volcanoes I think. The green one reminds me so much of my friend Toni, and I just know she’d love it. The gaps between the shops open up to a stunning vista of the surrounding western Tiers. 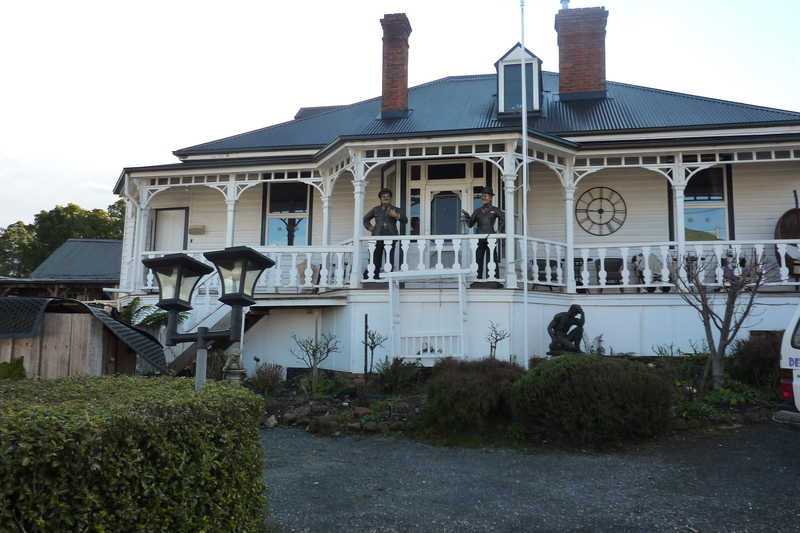 Even the guest houses are interesting to look at, like this one with its statues of Laural and Hardy on the balcony, and a garden full of statues and memorabilia. Theres even an old push mower powered by by an attached bicycle in one of the gardens. The cafes and pubs all serve very nice food, and have something special to recommend each and every one of them. 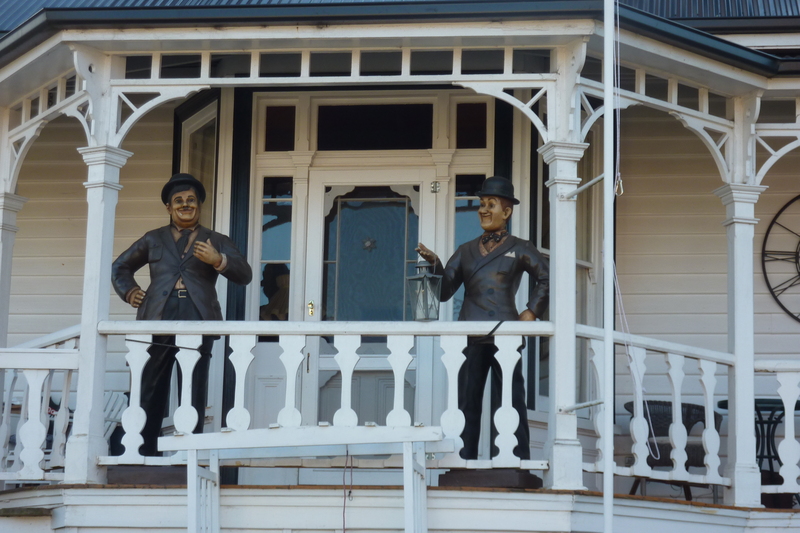 I”ll post some photos of a couple soon that are particularly good – one for its wood fired pizzas and balcony overlooking the Western Tiers, and the other for its 50’s memorabilia. My brother Garry will love that one. 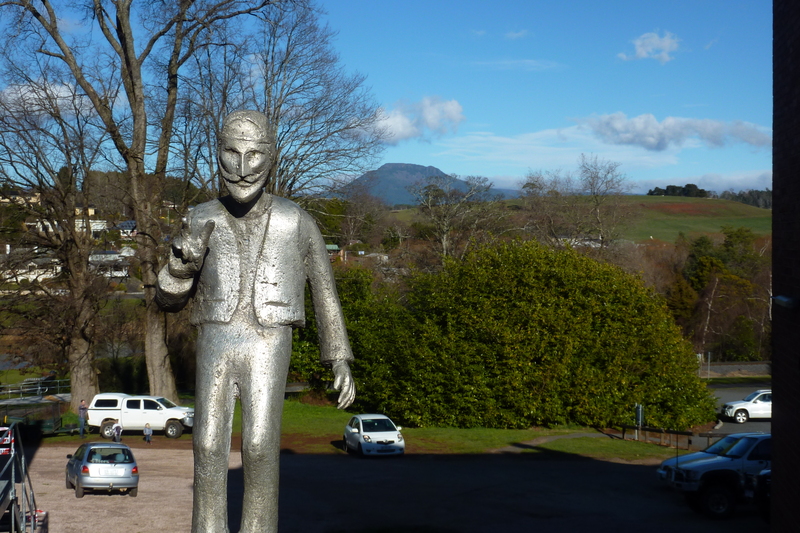 Yes, its no hardship at all having to stay a while here in Deloraine. < Turning 60 shaping up to be an infamous year.